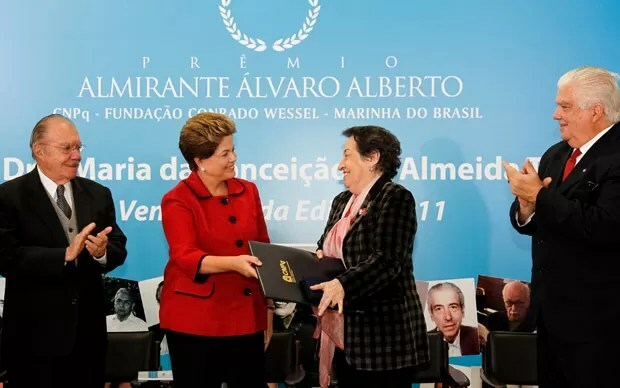 Renowned professor and economist Maria da Conceição Tavares received yesterday, May 17th 2012, the highest scientific prize granted by the Brazilian government. The national foundation for scientific research (CNPq) awarded Conceição Tavares for her lifetime theoretical and practical achievements. Tavares has influenced generations of students, scholars, and state officials. The significance of the award is that it goes to a female Marxist economist. Dilma Rousseff, Brazil’s first female president and herself a former student of Conceição Tavares, personally handed the prize. During the official ceremony Dilma made clear in her brief speech that “Conceição Tavares treated economics as it should be treated, as political economy”. Conceição Tavares used Marxian economics to theorize the limits and contradictory dynamics of the Brazilian 1950-1980 episode of import substitution and industrialization. Her main contribution was to explain Brazil’s industrial, financial, and exporting activities as dialectical processes. Her writings are mandatory references in any economics class on Latin American economies. Tavares also joined the selective group of economists that founded the United Nation’s Economic Commission for Latin America and the Caribbean (ECLAC), best known for its Spanish acronym CEPAL. Her work has had major theoretical and practical implications on the course of the Brazilian history of economic development.